Stockmans Friend - Performance products for natural healthy farms and animals. Performance products for natural healthy farms and animals. Stockmans Friend performance products include 100% natural New Zealand ingredients for natural healthy farms and animals. Our animal health products provide you with a cost effective and natural solution. Stockmans Friend makes a range of innovative natural feed product for all your farming needs. AHE contains Cider Vinegar, Garlic, Seaweed, Molasses & Bush Honey. It is made up entirely of natures' nutrients and has proven to be extremely beneficial to the health of all animals. It has no withholding period. 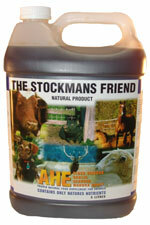 Stockmans Friend Hoof Oil is a blend of vegetable, fish and chicken oils with garlic to help heal cracks. Natural ingredients include biotin, vitamin E and sulphur. The natural oils in Stockmans Friend Hoof Oil will assist in the prevention of toe, quarter and heel cracks, a problem which arises when hooves are dry. Stockmans Friend Surf to Turf contains only natural nutrients and is 100% natural stock food supplement.